This is a listing for one of our Reversible Coffee Sleeves. 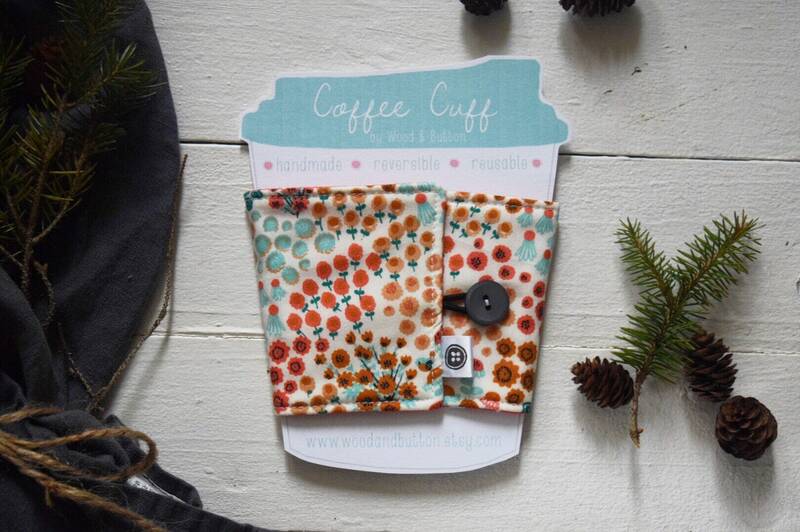 Go "green" with this reusable Coffee Cuff! 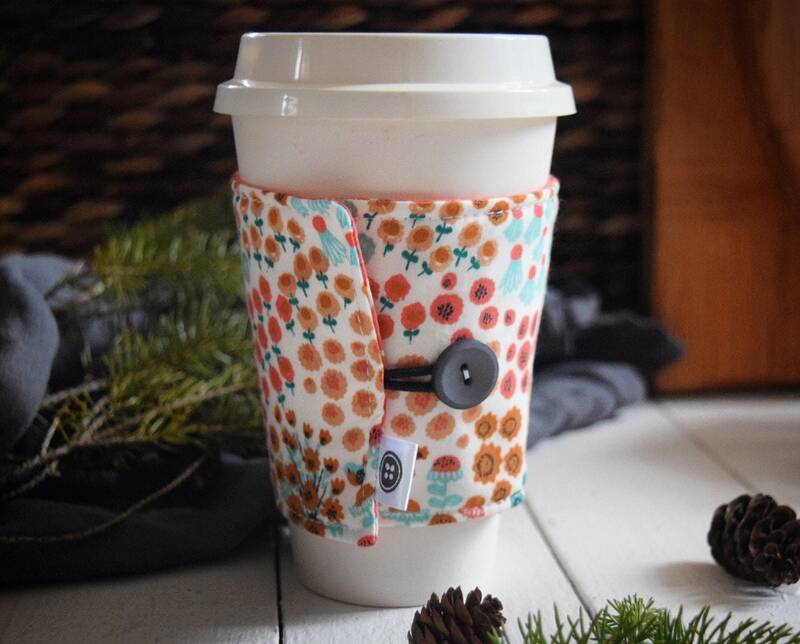 Use it to dress up those plan, paper or plastic, coffee or tea cups while you keep your hands warm and your beverage hot! Great for iced drinks too!!! They are REVERSIBLE!!! It's like getting 2 for 1! 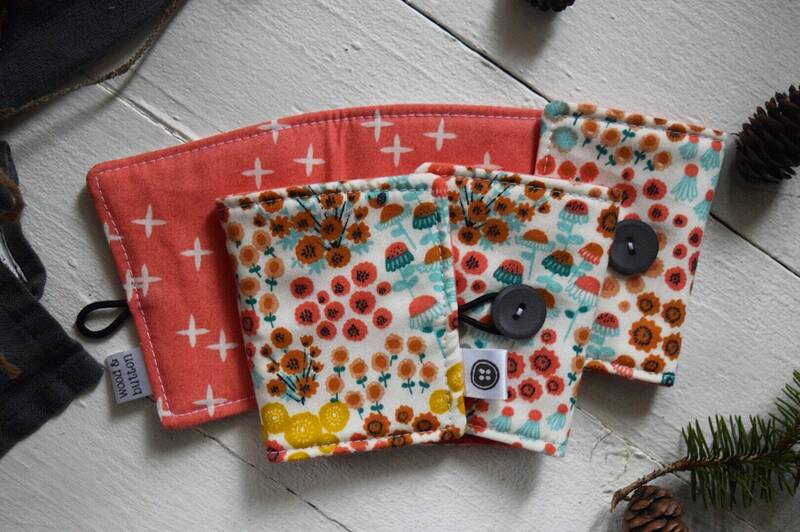 Folds flat for easy keep in your purse or store in your car for those times when you need it! Made out of 100% cotton with insulated lining for added protection. Machine washable, on gentle cycle and placed flat to dry. Each cuff is approx. 3.25" in width and 9" (at the bottom) -11" (at the top) in length. Patterns placement and button may vary, as each item is individually and uniquely made. *PLEASE NOTE:* Please be sure that your Paypal and Etsy shipping addresses match. If there is a conflict between the two addresses, I will ship to the address listed with Etsy, as oftentimes folks forget to update their address on file with Paypal. However I cannot be held responsible for addresses that have not been updated or are otherwise incorrect, so please verify this information before completing your purchase. Thank you! Wooden & Button cannot be held accountable for incorrect shipping addresses being provided, packages that become lost in the mail or are otherwise not delivered due to postal error, or theft. Wooden & Button cannot issue refunds for items that are claimed to be lost unless a lost parcel report from the U.S. Postal Service is provided. By purchasing items from this website, you agree to this policy. Please accept my apology for the inconvenience this may cause. Q: What about gift-wrapping and packaging? A: All orders arrive beautifully gift-wrapped and ready to give (or keep!) Please note, that not all items are individually boxed. If you would like me to include a special gift message, please indicate so in the message to seller section of your invoice while checking out. Q: Do you offer refunds or exchanges? A: We attempt to represent each item accurately, but if your order arrives and it does not meet your expectations we will work with you. We accept returns within 14 calendar days of the delivery date. Buyer pays for return shipping. We do not refund shipping charges or fees. Exchanges are handled on a case-by-case basis; please contact me for more information. Please note, that the Feedback section is not the place to discuss concerns regarding your order. If you intend to leave anything other than positive feedback, I ask that you contact me first so that I can have the opportunity to address any concerns. I truly value my customers and I want you to have a fabulous Etsy experience!